Well! Sometimes even the best laid plans..... The holidays took us by storm, not in a good way, but we're back on track now & will proceed as if nothing has happened at all except for lessons learned & scary places overcome. Praying Mantis joins us this week as a reminder that stillness & watchfulness are beneficial now. Even though the beginning of a new year seems to inspire us to action, this energy is too aggressive for the time of Mantis. For one thing, we're not quite out of the shadow of the Mercury retrograde of last month, so that alone tells us to wait a bit before springing into action. Mantis also warns of not only inappropriate timing, but of people in your business &/or personal lives who may be showing you a face of friendship or love outwardly, but who are manipulating or betraying you behind your back. Broken promises in friendship, business & love can be uncovered now. Pay close attention to your intuition. 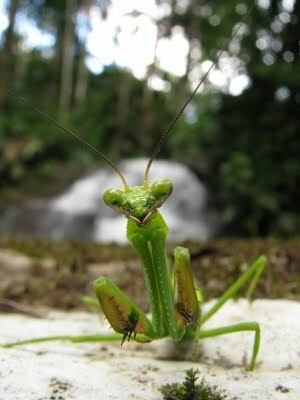 Mantis teaches the value of stillness. This can be a wonderful time to explore a new meditation technique, extend the time you already spend meditation, re-energize your dream work. Pick a Tarot card with the intent of discovering what you most need to work on right now, & then set aside uninterrupted time to meditate upon that image; ask for guidance from the spirit of that card. This won't be predictive, but is a fascinating way to uncover whatever may be blocking you or sabotaging your efforts now. For the rest of this week protect yourself by being hyper-aware of your surroundings, keep your own council, gather power in stillness. Happy New Year to All of You Who Join Us on This Journey.